I’m rather smitten with one of Fiesta’s newest offerings, the crescent dish. The crescent shaped dish was popular on tables during the Victorian, Edwardian and early twentieth century, but fell out of favor over the years. I bought one in Sage, but I may get some more in the future. I don’t have a set of china with the crescent dishes as part of the set and I think they are neat! 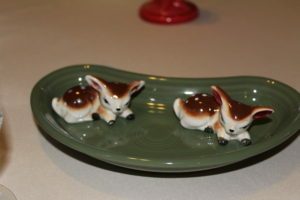 Fiesta Sage crescent dish with a set of antique fawn salt and pepper shakers.